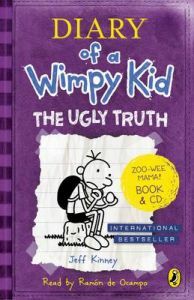 "The Ugly Truth book & CD" is a gorgeous gift edition of the bestselling fifth title in the "Diary of a Wimpy Kid" series by Jeff Kinney. Perfect for holidays and long car journeys! Greg Heffley has always been in a hurry to grow up. But is getting older really all it's cracked up to be? Suddenly Greg is dealing with the increased pressures of boy-girl parties, increased responsibilities, and even the awkward changes that come with getting older. And after a big fight with his best friend Rowley, it looks like Greg is going to have to face the "ugly truth" all by himself. Praise for "Diary of a Wimpy Kid": "The world has gone crazy for Jeff Kinney's "Diary of a Wimpy Kid" series". ("Sun"). "Kinney is right up there with JK Rowling as one of the bestselling children's authors on the planet". ("Independent"). "Hilarious". ("Telegraph"). "The Diary of A Wimpy Kid" series is an international bestseller, having sold over 50 million copies worldwide, and has now been made into three blockbuster films. The original "Diary of a Wimpy Kid" book has recently won the Blue Peter Award for the Best Children's Book of the Last 10 Years. As well as being a bestselling author, Jeff is also an online developer and designer. He lives with his family in Massachusetts, USA. As well as being an international bestselling author, Jeff Kinney is also an online developer and designer. He is the creator of the children's virtual world, poptropica. He was named one of Time magazine's 100 Most Influential People in 2009. He lives with his family in Massachusetts, USA.